my pointless: annoy your friends. win at Scrabble. 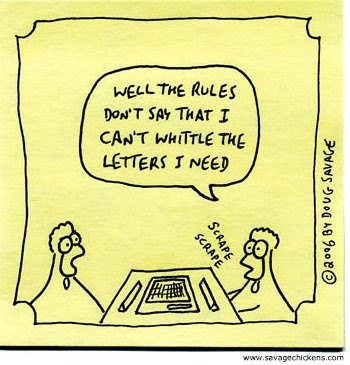 Have you ever played Scrabble and had a few extra letters you couldn't get rid of? Have you ever wanted to squeeze a word into a small space or use a Q when you didn't have a U? 2. Qat – a flowering plant native to East Africa and the Arabian peninsula. 3. Zax – a slate mason, or the tool used to cut and punch nail holes in roofing slate. 4. Cwm – a valley, especially one created by glacial movement. 6. Qua – as or as being, or in the character of. 7. Suq – a market, or part of a market, in an Arab city. 8. Adz – an axe-like tool. 10. Qadi – a judge in the Muslim community. My wife is addicted to online Scrabble. I wonder what the medical term is for that? I can TOTALLY vouch for those words and have used several of them frequently. Qua happens to be my personal favorite and actually got 45 points one time for it! Thanks for the offer, k8knits, but I am pretty sure you would KILL me at this game. Do you travel to participate in tournaments or are there tournaments locally? Is there any online play? improve... more people should play tournaments!! club, based in Romania :) a lot of tournament players hang out there. has a lot of bugs. i really enjoy scrabble at all levels, so if you did wanna play, let me know!